Part of the fun of exploring backwoods Georgia is staying in a place that’s equally isolated. And in that respect, the Suwannee River Eco-Lodge (www.gastateparks.org/SuwanneeRiver-EcoLodge) fills the bill perfectly. 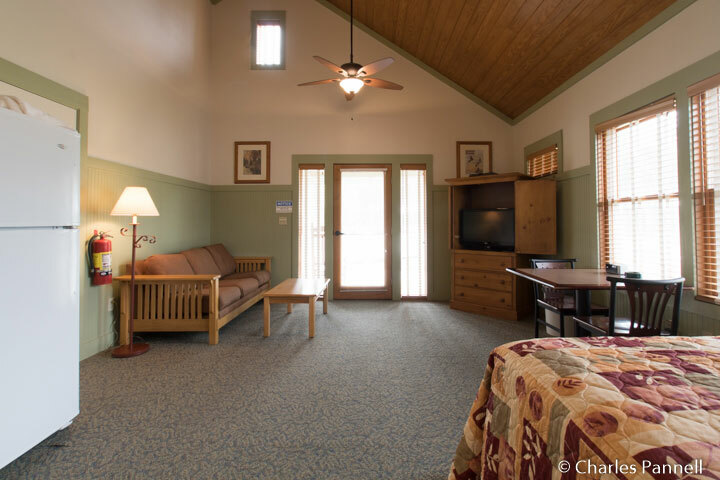 Located on the outskirts of Fargo, about 45 minutes from Okefenokee National Wildlife Refuge, this rural property boasts eight comfortable cottages, half of which are wheelchair-accessible. Due to its isolated location, a little advance planning is in order to facilitate a trouble-free “check-in”. There’s no on-site staff, as the eco-lodge is managed by Stephen C. Foster Park, some 18 miles away. With that in mind, guests need to call the park office the day of their arrival in order to get the key code for the gate, as well as the combination for the lock box that holds their individual cottage key. The catch is, cell phone reception is spotty at best in Fargo, so plan ahead and contact the office well before you head out to the boondocks. Once you arrive at the eco-lodge you’re on your own to find your cottage, but since the layout is pretty straightforward, that’s not a daunting task. Parking is available in a level area near a boardwalk that leads over to the cottages, and even though the lot isn’t striped it’s pretty large, with plenty of room for an adapted van. The whole complex is connected by a boardwalk, and it’s surrounded by a pine forest, and even with a full house there’s plenty of privacy. Besides the cottages there’s also a conference room, a smaller meeting room, a BBQ in a shelter and a commercial kitchen in the complex. Cottage 6 is an efficiency unit, and it can sleep up to two people. The main living area is furnished with a 26-inch high double bed with wheelchair access on the right side (as you face it), a sofa, an armoire, and a table with two chairs. It should be noted that the sofa is not a sleeper sofa, however since it’s 18 inches high it might be usable for one person if the bed is too high. The compact kitchen area is equipped with a stove, a microwave, a dishwasher, a full-size refrigerator, a coffee maker and even a toaster. It’s also outfitted with a full contingent of plates, cups, glasses, utensils, and pots and pans. There’s good pathway access throughout the main living area, and level access out to the large screened porch. The porch is furnished with two rocking chairs, and it’s a very pleasant place to enjoy the sunset. It’s also pretty private. I have to admit that I did a double take when I walked in the bathroom, as it had two of everything. Seriously. One shower is a roll-in model, and it measures 36-inches square. 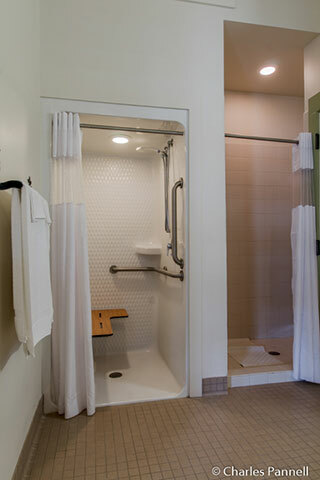 It’s equipped with a hand-held showerhead, grab bars and a fold-down shower bench. There’s also a low-step (3 inch) shower next to it, which is about five feet long and three feet deep. 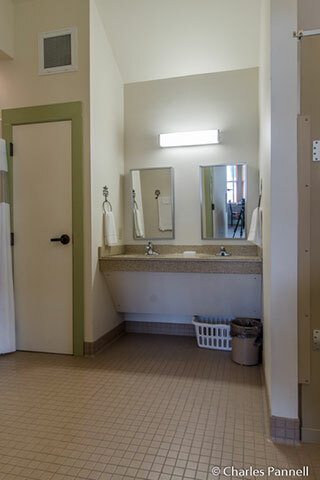 A lowered vanity with two roll-under sinks and a lowered mirror is located in the middle of the bathroom, and two toilet stalls are located on the far end. 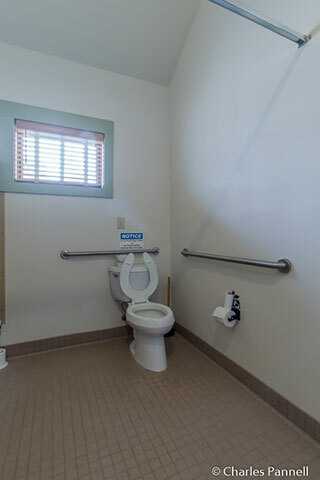 One stall has a standard toilet, while the other has a five-foot turning radius and is equipped with grab bars on the left and back walls (as seated). And even though this bathroom is overflowing with fixtures, there’s still room for even the largest power wheelchair or scooter. There are also three other equally accessible cottages in the complex. Cottage 5 is another efficiency unit with a double bed that can sleep two people; while Cottage 9 and Cottage 2 are one-bedroom units, and they each have two double beds and can sleep four people. The eco-lodge is a good choice for individuals or small groups, as you can book one cabin or the whole lodge (which can sleep 40 people). One night we had the place totally to ourselves, and the other night we shared it with a few paddlers. And to be honest, we only knew the paddlers were there from their cars, as they were extremely quiet and they left well before dawn. 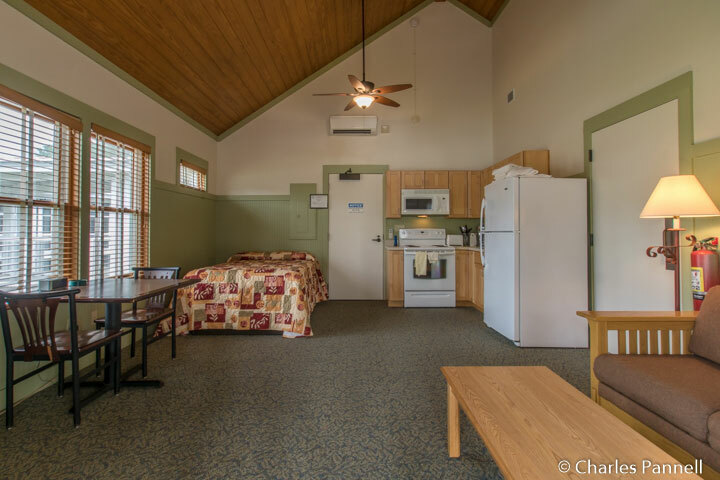 Bottom line – the Suwannee River Eco-Lodge is a very accessible choice, and a it makes a great home base for exploring nearby Okefenokee National Wildlife Refuge.